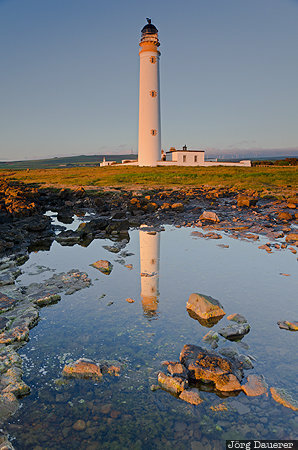 Barns Ness Lighthouse and its reflexions in a tide pool illuminated by warm morning light. Barns Ness Lighthouse is near Dunbar in Fife in the south west of Scotland in the north of the United Kingdom. This photo was taken in the morning of a sunny day in June of 2013. This photo was taken with a digital camera.